I gazed in amazement at the screen. Before me were all-black, jointed figures—silhouettes—animated against coloured backgrounds of varying complexities. Each had a stylized profile for a face, and while some were beautiful and possessed of grace, others were not. Others were grotesque, and some were monsters. All of them moved, and whether locked in combat or touching delicately their hands or lips, they were so human. 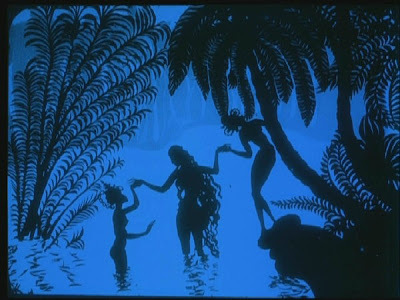 Lotte Reiniger, a German artist, needed nearly three years to complete The Adventures of Prince Achmed, the earliest surviving animated feature film. She was blessed: with talent, a wealthy patron who recognized it, and a gifted husband, Carl Koch, who was her life-long partner in filmmaking as in all else. This film, Reiniger’s first, is as indisputable a display of genius as anything I’ve ever seen. 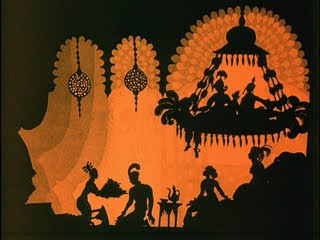 Without her vision, and mastery of the skills needed to fashion paper puppets and make them move on-screen, Prince Achmed would be nothing but a set of odd, angular stills, inspired by the tales of One Thousand and One Nights. Reiniger delivers a film that awes you first, then makes you think. Like any animator (or cartoonist), she begins by establishing a set of defining characteristics for each of her characters. In this film, such distinguishing traits make all the difference, because the characters are solid black and unshaded—only the details of their outlining shapes allow us to tell them apart. Called upon to consider these details, we are dazzled. Dinarsade’s veil is the most delicate lattice-work; the magic princess Pari Banu poses, walks, runs and flies with an eroticism entirely in keeping with whatever Achmed seems to see in her. Aladdin—the trickster—has a sloping nose that makes him look weaker than the warrior Achmed, whose own profile has the nobility of a Roman bust. Reinegger isolates each character’s essential traits, then expresses them physically; since no one has a ‘face’ in the three dimensional sense, these traits must do much of the work. For the rest, we rely on the puppets’ movement. Again, Reiniger’s vision is incredible, as she was clearly not satisfied with the simple novelty of animating this way. Achmed and the other figures move with naturalistic ease, even being called upon to ‘perform’ when the situation requires it. The film’s most impressive scene finds Achmed a captive in a pleasure palace filled with shapely girls. Achmed likes them as much as they like him, so they proceed to act out a vaudeville-style piece of slapstick, as he jumps from one girl’s arms to the next, culminating in the classic bit where two girls try to kiss him at once, only he ducks, and they kiss each other. Consider the technical challenges of that. Reiniger, like the thinkers behind Felix the Cat, turned a negative into a positive. Like the silent Felix cartoons, Prince Achmed depicts characters that are highly simplified, and undetailed inside their exterior lines. In the case of Felix, this produced a crude drawing, but one that was endlessly elastic—Felix could transform into any other black object with little taxation for the viewer. If he didn’t look much like a real cat, but we could accept him as one anyway, it was that much easier to accept him morphing into something else, however simplified that, too, had to be. Achmed, Pari Banu and the rest are hardly crude. But they are also, in their ornate design, just as fluid as the Cat. Reiniger’s African Sorcerer, the chief antagonist of the film, can become anything he wishes, simply by stretching or folding components of himself until he vaguely resembles say, a kangaroo, more than he vaguely resembles a homely old sorceror. 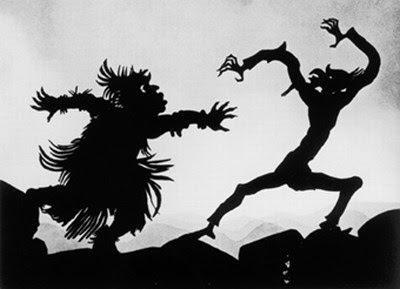 From there, Reiniger needs merely to ensure that he moves like a kangaroo, and the illusion will succeed. This technique culminates in a Wizards’ Duel between the villain and a benevolent witch, where each combatant morphs from one animal to the next in order to best one another. 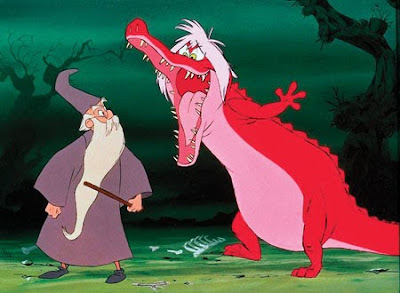 The idea was re-visited in Disney’s The Sword in the Stone, 37 years later. Presented with an aesthetic like this, done so beautifully, I couldn’t help but feel a bit spiritual. How could you not think of the commonality of all things, human, animal and inanimate—aspects of the same, shared material that ultimately unifies the world? And if these shapes can then be distinguished, then defined separately and appreciated, by what means is this done? By us, through our perceptions first, and then our reason. 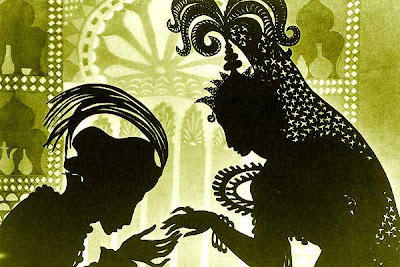 We are the arbiters of what we see, and when we’re made conscious of it, The Adventures of Prince Achmed becomes a strikingly modern tale. For an explanation of Reiniger’s animation process—in her own words—click here. Die Abenteuer des Prinzen Achmed is distributed by Milestone Films. The DVD also includes Lotte Reiniger: Homage to the Inventor of the Silhouette Film (1999); a thorough documentary about the long, turbulent and ultimately uplifting life of the film’s creator. Hah, here you go. Check out this article for Pienkowski's influences..not Reiniger, but the forests of Poland. But maybe he did see this film - who knows? I tell you, the first image on this page is exactly the same as his illustrations for Aiken's books! Isn't that a great movie? You capture many of the wonderful features, the fluidity of the characters, the way mere outlines show character, the humor and what they used to call the heart interest. Thank you for sharing with all of us. This sounds wonderful. What vision Reiniger must have to conceive of something so unusual and to stick with it. A person really ought to watch this ASAP. I've been meaning to watch this for ages, in fact it was my first choice for this blogathon but I was too slow to claim it. That said, I thoroughly enjoyed your post, it was a wonderful homage to a visually stunning film.